What’s The Most Popular Exterior Shutter Color? American homes use a myriad of colors for outdoor home enhancements. So, what are the most popular exterior shutter colors? Everyone knows the expression “<Blank> is the new black.” Complete that sentence with any color imaginable; orange, green, red, white, blue, yellow, pink, purple. Notice how the saying always starts in relation to black. There is no substitute for the base standard. Black is, and always will be, the most desired of all popular exterior shutter colors. Painting wood exterior shutters is no exception to that rule. Black shutters are currently the favored selection by American homeowners and ShutterLand customers. The paint color black is timeless and classic. Black is not a fad and will not go out of style. ShutterLand provides customers ordering painted exterior shutters a palette of nine popular standard colors. If a more specific color is required, thousands of selections from Benjamin Moore and Sherwin Williams are offered. Choose from any of the popular exterior shutter colors. Benjamin Moore Black (PM-9) is the most favored standard color. Tricorn Black shutters from Sherwin Williams, while not on the standard list, is very similar in tone. The use of exterior black shutters transcends both home style and location. 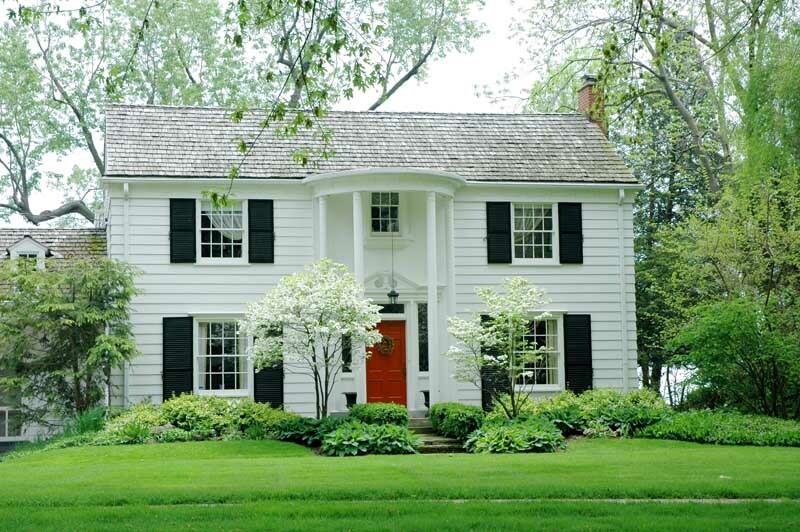 The most prominent combination is the very iconic white house with black outdoor shutters. In addition to black shutters, a very dark green has been historically used in southern states. Known to some as Charleston Green, this almost black color was created during Reconstruction following the Civil War. According to legend, Charleston residents rejected the the black paint provided by Union troops by tinting it with yellow and green. The widely used paint is similar to the standard traditional color Black Forest Green available from ShutterLand. While there are functional benefits to wooden outdoor shutters, the main purpose is typically to enhance the appearance of a house or building. 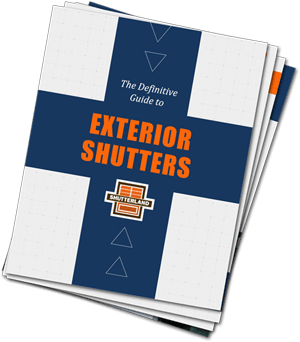 When installing exterior shutters for aesthetics, it is important to understand the basics of selecting a color scheme. Exterior paint colors are grouped into three or four parts. The base, or body, color is applied to the primary surface of the building. The trim color highlights windows, doors, and rooflines. Finally, accent colors complete the facade, adding additional color to outdoor shutters and exterior doors. This is where black is used most. A second accent hue is occasionally employed to emphasize other features. Black outdoor shutters are both classic and blend with almost any color palette. Black provides contrast, depth, and balance to a structure and stands alone as the most popular exterior shutter color.